Giveaway dose: CLOSED - International Giveaway - Win a Jewelry for free of your choice . CLOSED - International Giveaway - Win a Jewelry for free of your choice . Kindly revert to my mail within 48hrs or else i have to select a new winner . 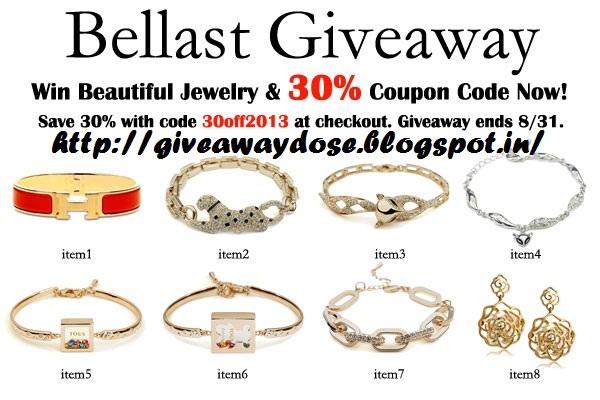 Plus everyone can use the coupon code30off2013 at Bellast, in order to enjoy the 30% discount. Plz follow all the 5 mandatory rules. KINDLY DON FORGET TO Leave a comment stating the registered email, name, the item link you like . Thanks for the amazing post and giveaway. I am a big fan of animal prints and love to collect the different products to my wardrobe and i found this Bracelet a statement piece to style the leopard print dresses. Wow nice giveawayy..I would love item2.. I just loved this piece and wish i win this. I just loved this item and wish i win this. I would like to win the item no. 5. Thank youfor this beautiful giveaway! 2. Liked Bellast jewelry in FB as Oksana Zolotukhina (Оксана Золотухина). 3. Folowed your blog via GFC/Bloglovin as snow_2000 (Oksana Zolotukhina). I like the item #4: DELICATE RHINESTONE CRYSTAL FOX CHARM BRACELET WITH WHITE GOLD PLATED. I would like to win the item no 5. Black and White Striped Legging !! Firmoo Glasses - Summer Must Have ! !